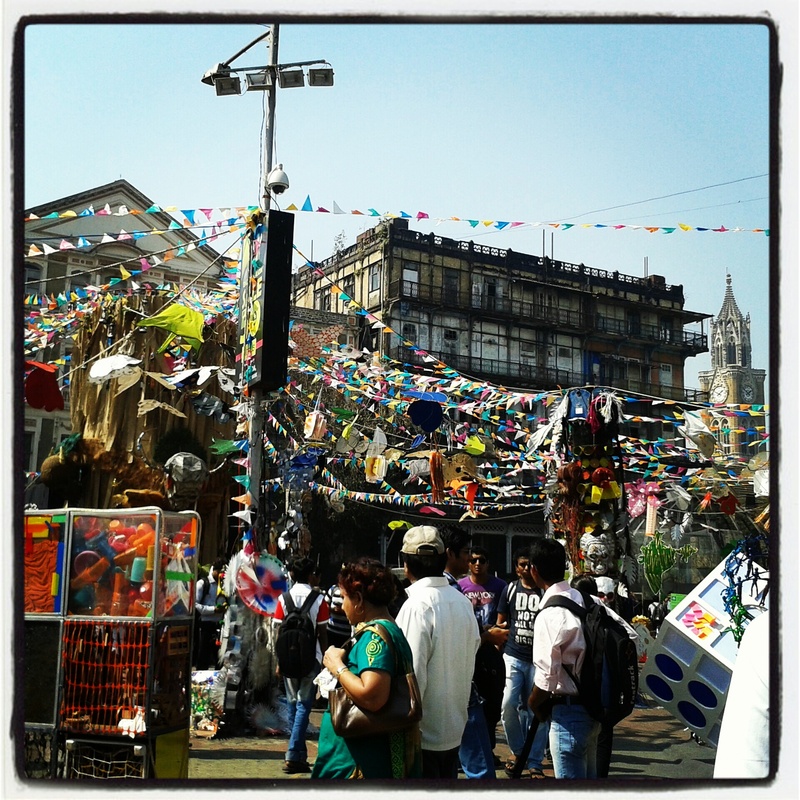 When I landed in Mumbai, the city was abuzz with the Kala Ghoda Art Festival which is an annual event. Friends and family – all insisted that it’s a must visit. I opened the newspaper and out popped a complete itinerary of the events for the day – the list was pretty comprehensive from live performances of dance, drama, street plays, music to workshops on ceramic, silk painting to cooking classes by some well-known chefs to a wine fest to art installations to movie screenings to Heritage walks to ………………!! The event was spread across galleries, museums, crafts centres and what not. Phew! it was endless but overtly impressive. I downloaded the guide which was a complete list of all events for all days, starting from the 2nd Feb to 10th Feb 2013. 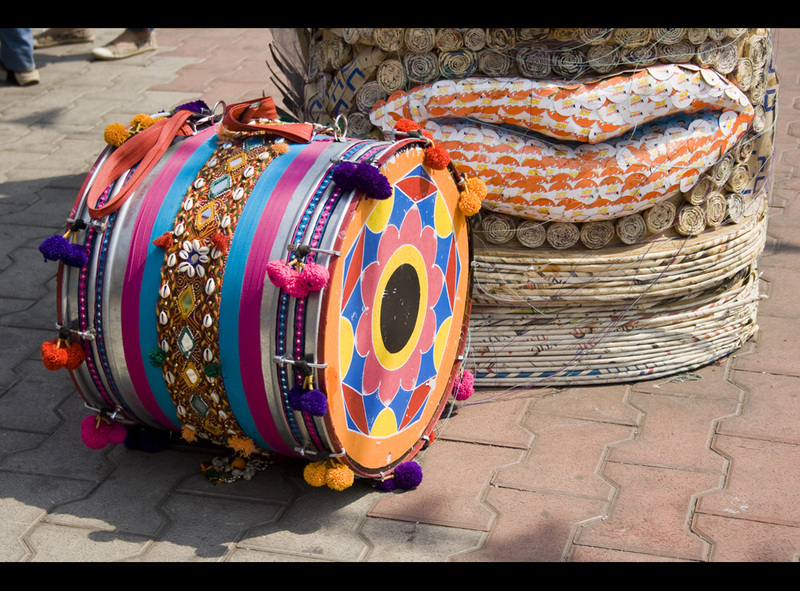 I was intrigued by the ceramic and silk painting workshops, journey of Mumbai heritage buildings through the camera lens, the bus tour, street installations and of course the wine festival. Wary of the crowds, I decided to avoid the weekend rush and landed at 11.30 a.m. on a Friday morning at the Rampart row. The area was kitted out with flags, banners and not to mention police checkpoints. Frisked with my bag checked, I landed on the other side of the checkpoint only to feel like Harry Potter on his first visit to Diagon Alley – needed 8 pairs of eyes to take it all in. Everywhere I looked, art beckoned me in a dazzling display of scale, creativity and colors. Huge totem pole like artworks dominated one section with multicolored flags streaming in the wind above. 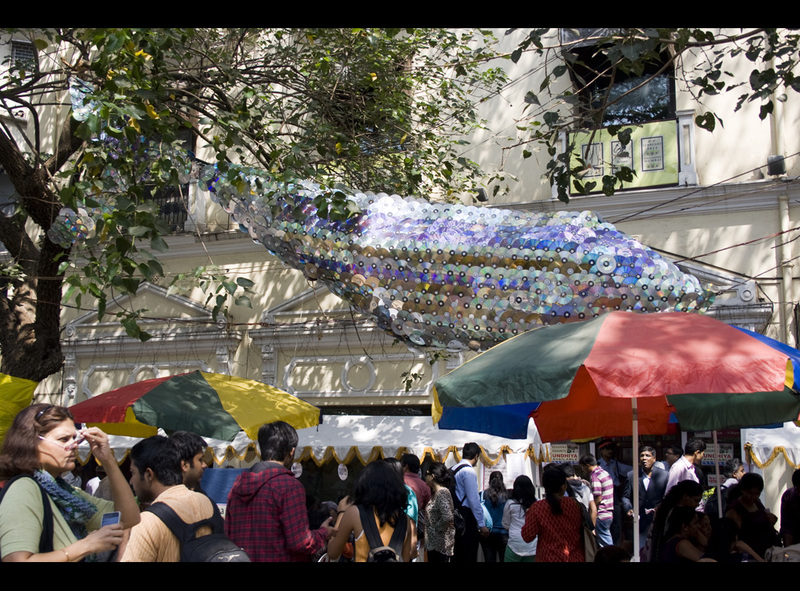 A huge fish, crafted out of CDs was hung from a tree atop the food stalls. It caught the sun and glinted like crazy. 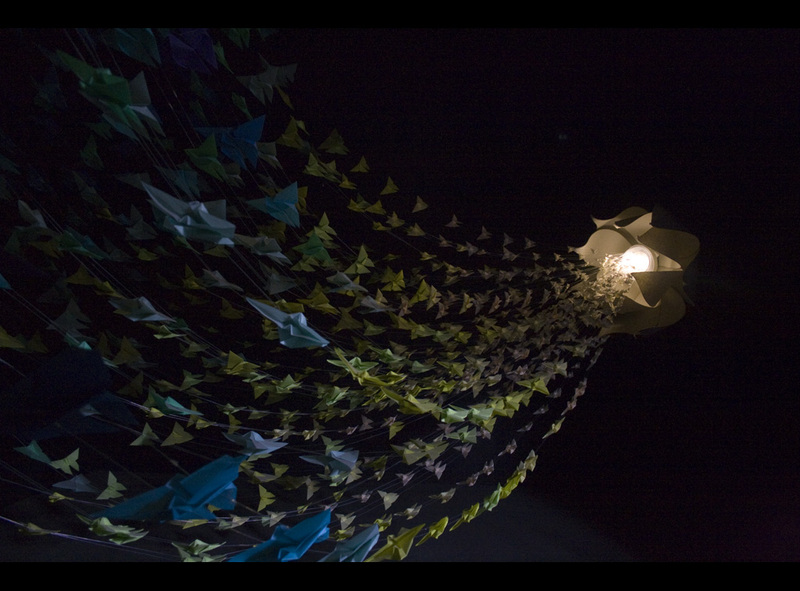 Origami crafted butterflies in bright colors and varying sizes made a pretty eye-catching pattern in a black fabric covered kiosk which had more inside. 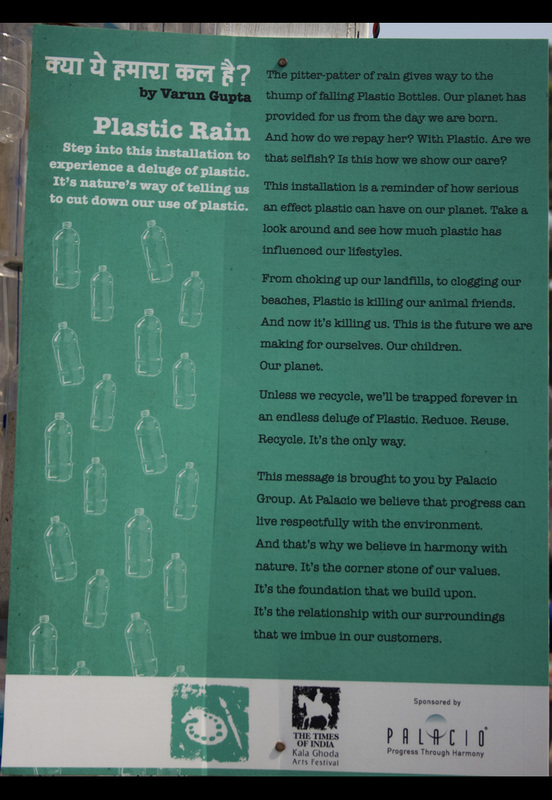 Strings holding rows of plastic glass bottles mimicked “plastic rain” and invited the viewers to enter and experience the feeling of it. 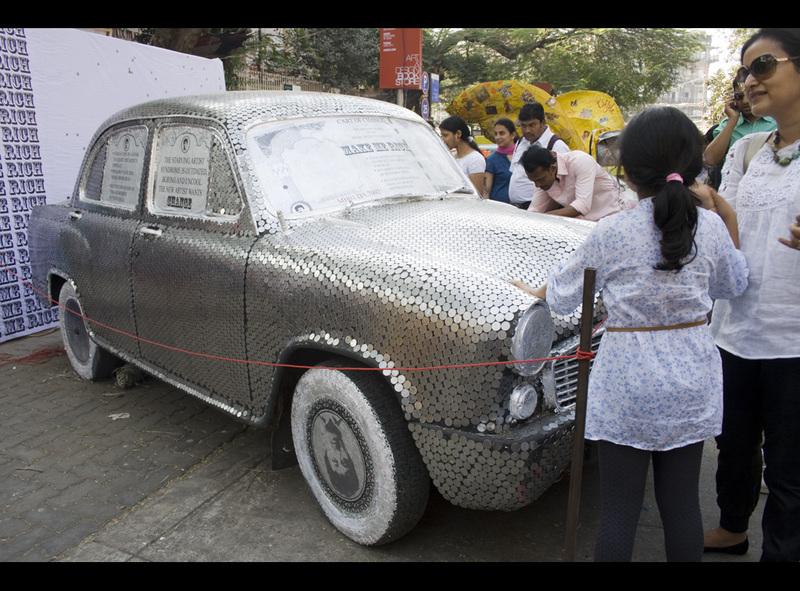 An ambassador car covered in 1 rupee coins and invited the visitors to stick one on a wall graphic which, once filled, would create the artist’s face. Enthused to see people participating in this with great verve. 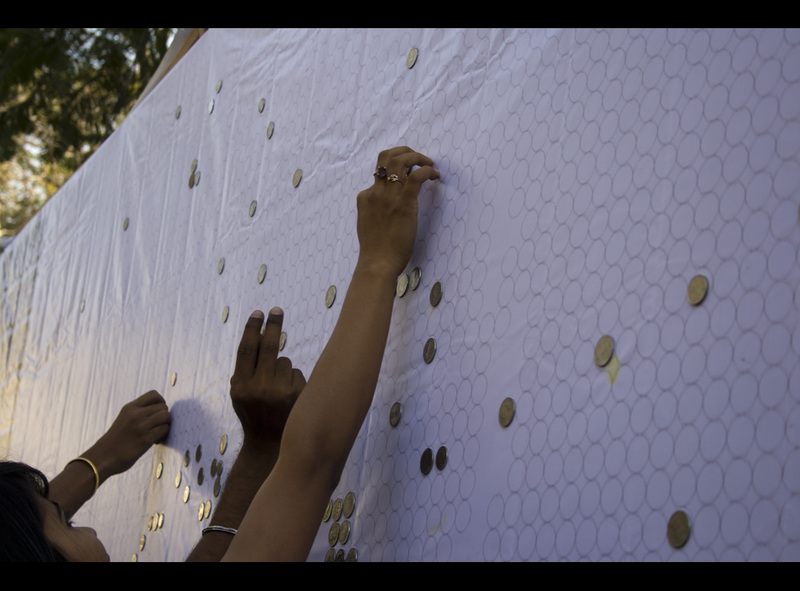 Yes, I stuck a coin too and hoped the installation got completed before the fest ended. The green theme seemed to be it for this year’s fest. 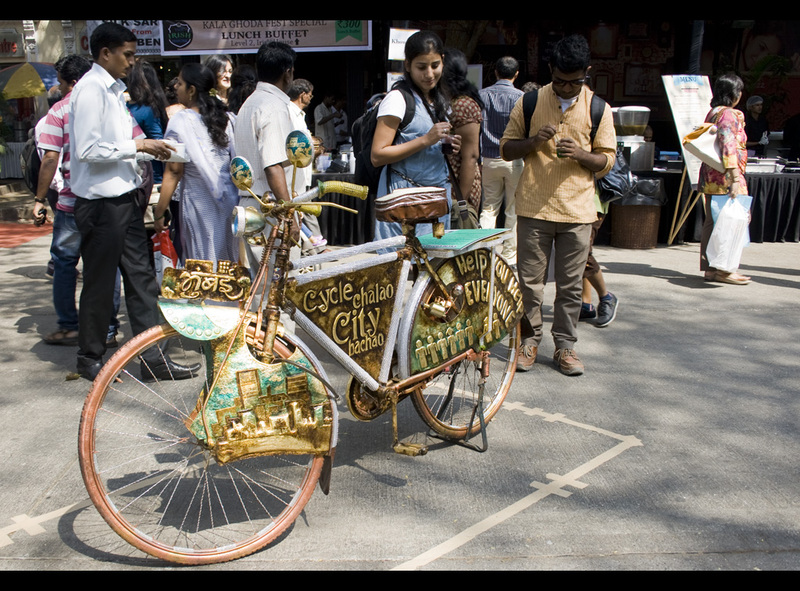 A beautifully worked cycle proclaiming its green benefits stood proudly and was being admired by all. Vanishing gardens from our lives must have prompted this display. Loved the creativity and ingenuity of the ants crawling near a tree. 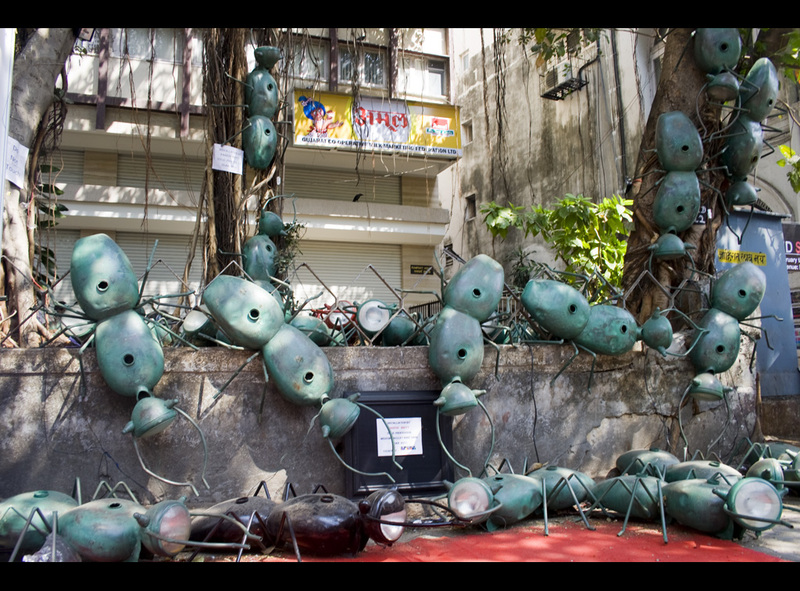 Apparently this is a 2009 exhibit by famous Indian Artist Jitesh Kallet. 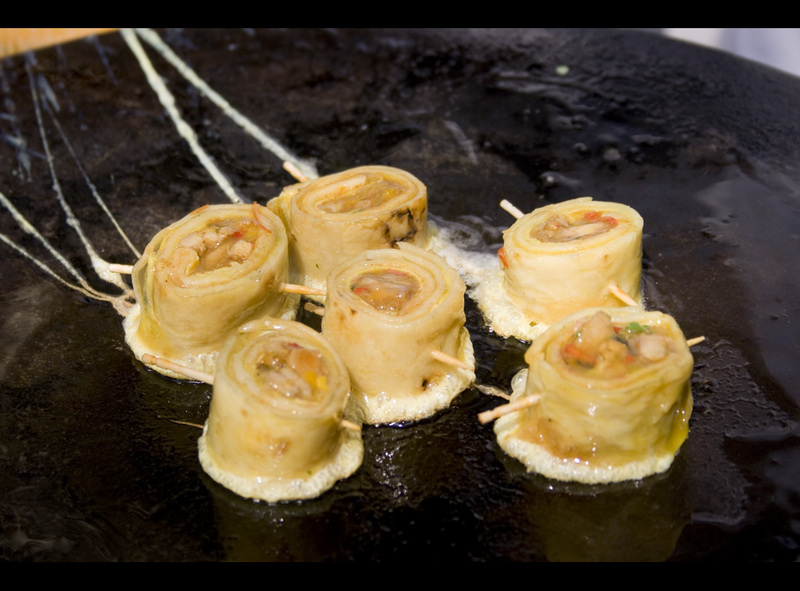 A magnificent tribute to the famous “tiffin – wallaha”s or dabbawallahs of Mumbai. The life-like model of a dabbawallah with his traditional carry gear on the head. Only the dabbas resembled tall condominiums of Mumbai. This artwork depicted the everyday struggle of us humans in this world. Seems we weave our own tangled webs and get entangled in it too. But this installation took the cake as far as I was concerned. 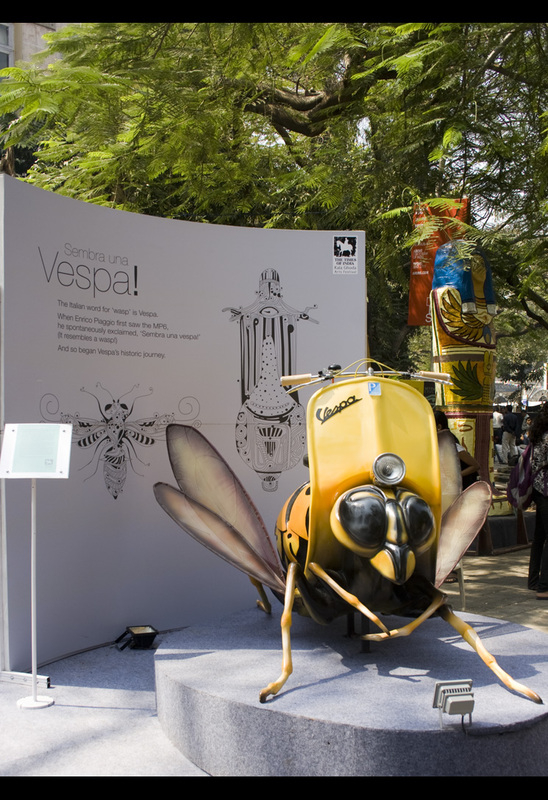 Such lady like delicacy in this wasp or vesper. Salute to the Italians for the interpretation. All this color and pattern in the shadows of gorgeous gothic architecture which dotted the cityscape and formed the perfect backdrop for this homage to art and crafts. I started with the art installations but got distracted by all the colorful and creative wares being sold at the stalls lining either sides of the street. 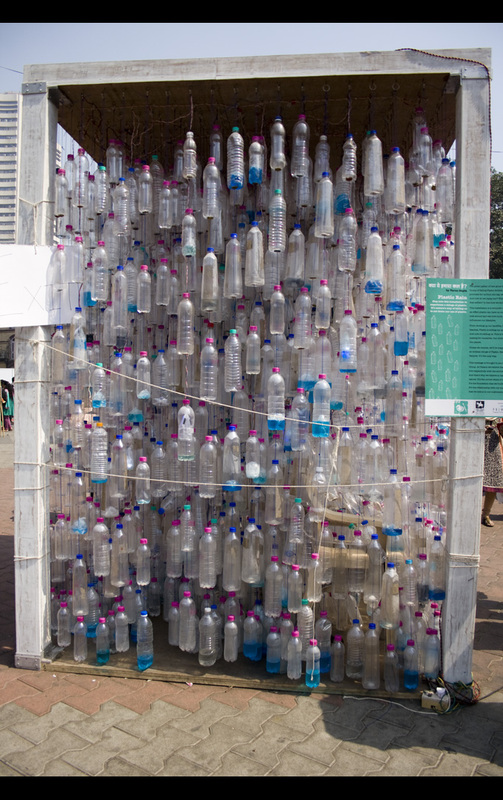 The creativity or rather the ingenuity of the artists who had put up their stuff here was quiet astonishing to me and I salute the organisers for discovering their talents and giving them a platform to display it all. It was heartening to hear that most of the creative artisans were invited to participate in the fest from as remote as Barmer in Rajasthan to Chhatisgarh to the Eastern states. So while one stall sold ceramic plates with patterns cut out in them, another sold creative clocks made out of slagged glass alcohol bottles. 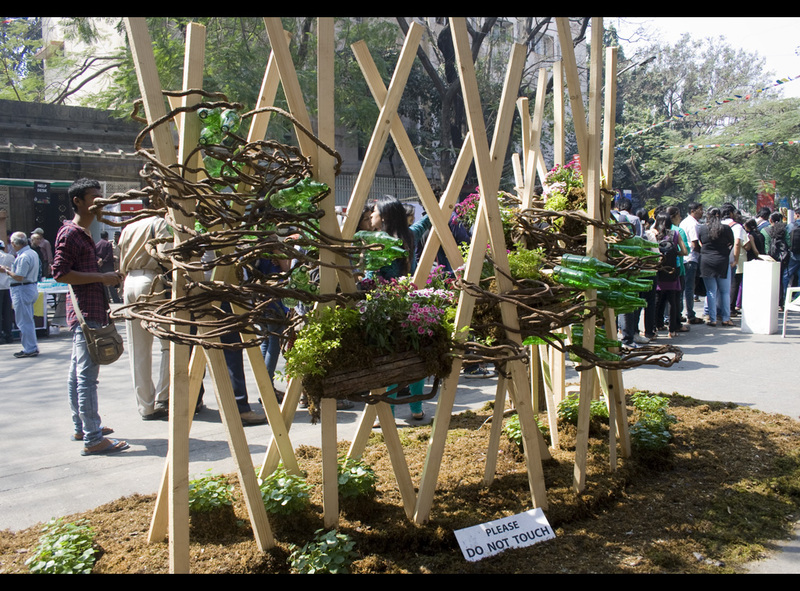 The ash trays, lamps and clocks made out of glass bottles were not only creative but a great draw at the fair. 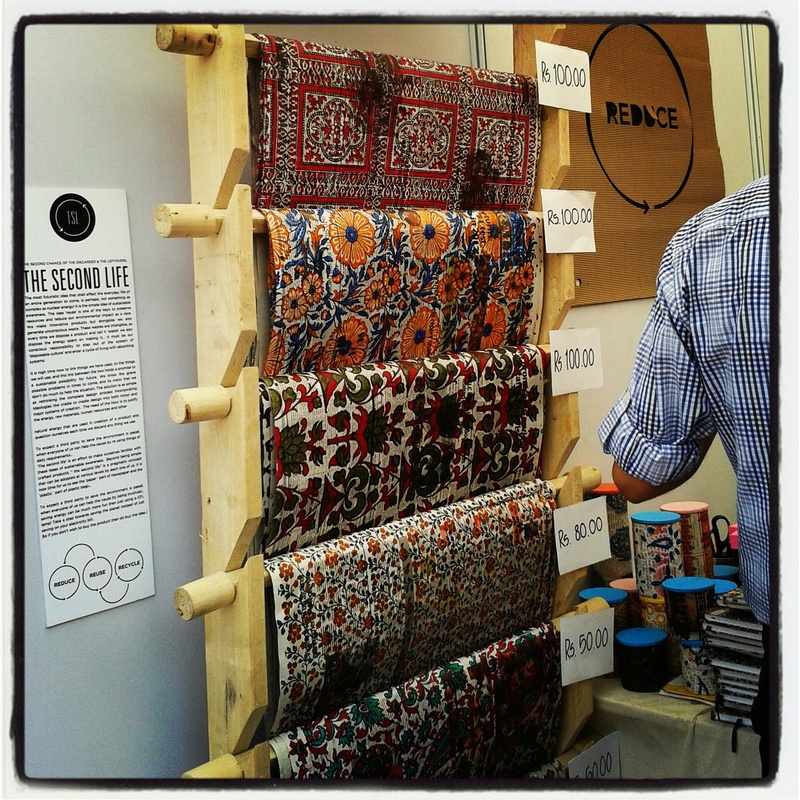 Another had recycled newspaper to convert them into gorgeous and colorful wrapping sheets by block printing on them. A Mumbai based artist made great use of the creative talents of the brasswork artists of Uttarakhand district to craft exquisite works which were being greatly appreciated by one and all. I couldn’t resist picking up a few items from there. 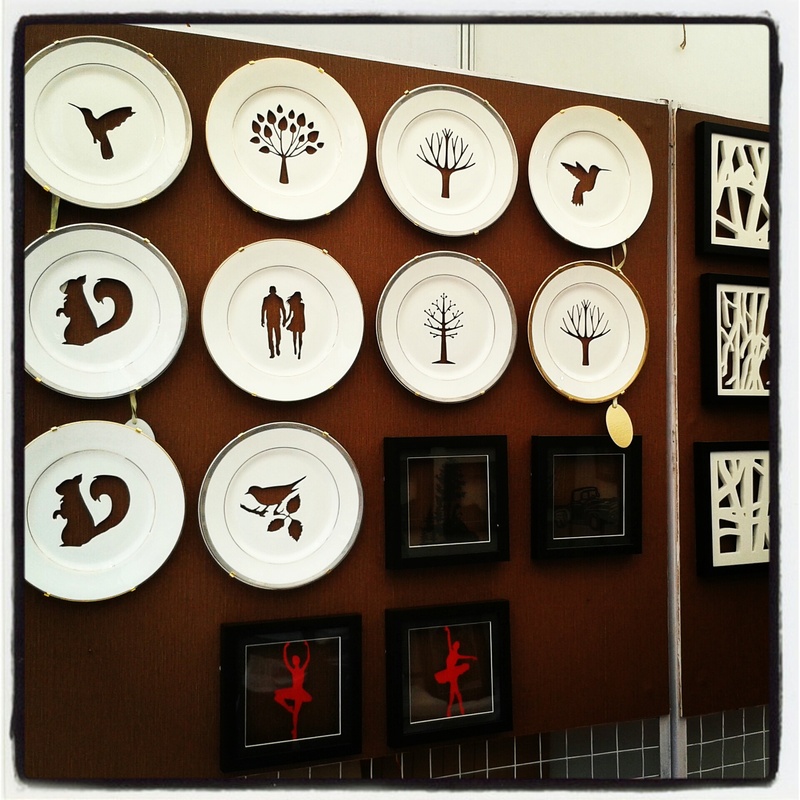 Loads of retro chic and Kitschy items were on display at numerous stalls. I simply had to buy some kitschy cushion covers and a wallet at one such stall. Cant wait to get back home to display them all. Most of the vendors were friendly and great salespeople. I loved the interactions with all of them and most were thrilled to share info about their products and ideas. I picked some really neat stuff from a couple of NGO stalls – a hair clip manager and an organiser for the kitchen, some laser cut cards with beautiful designs, tribal mask magnets and a turtle – maybe it will bring me some luck. Loads of food stall with some awesome foodstuff though a bit steeply priced. For lunch I tried out something called the “chicken baida roti” ( 150/- for a plate of 6 pcs) which the chef informed me were rolls of roti with a filling of sautéed chicken, capsicum and onions and cut into smaller pcs ( like pin wheels) and dipped in beaten egg and then shallow fried. These were served with a spicy green chutney. I paired this up with a Virgin mojito( 100/-) which was ultra refreshing. ( I came back for one more later to energize myself!!) I munched on some strawberries dipped in chocolate (40/- each) and a chocolate dipped wafer( 10/- each) as well which were great mood lifters. I think the chocolate shots were the most popular sell of this stall. 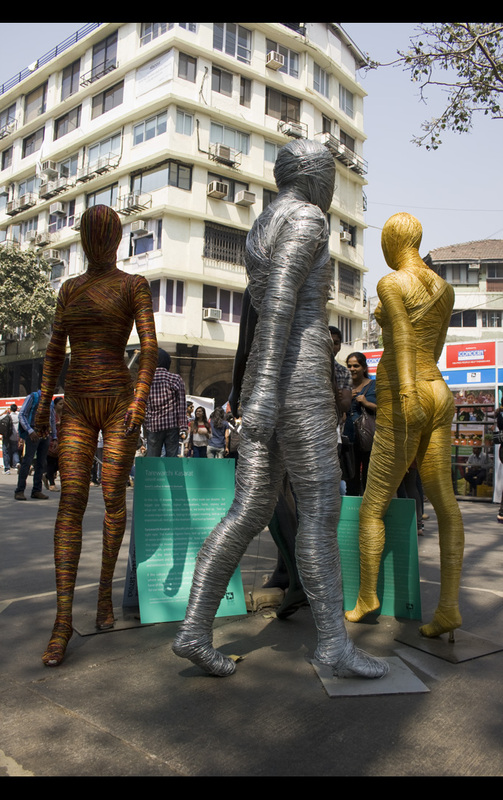 The venue was alive with street performers who interacted with the crowds and were a big draw. 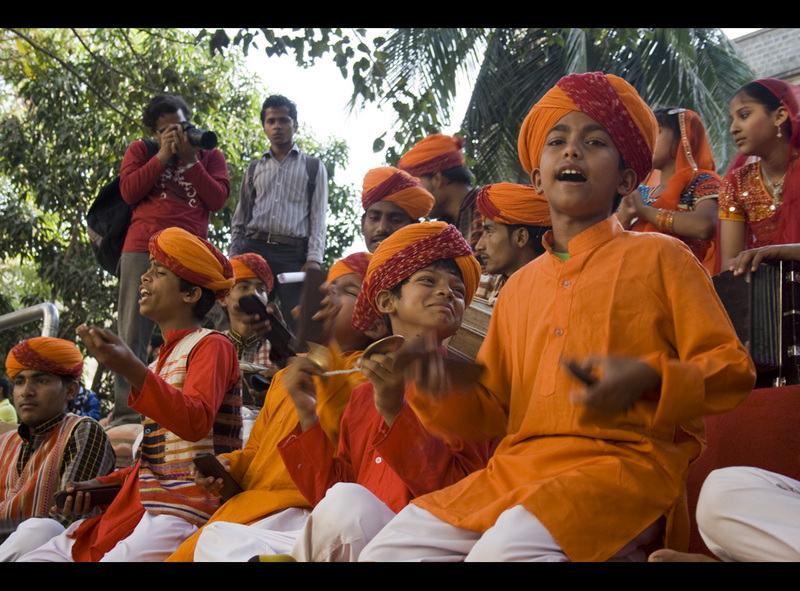 A band of Rajasthani folk singers consisting of loads of young kids in colorful rajasthani garb were the centre of attraction. All photographers seemed to converge here to take pics of the colorful tableau; replete with a videographer. I tried to get to the artisan centre for the ceramic workshop but got utterly lost. 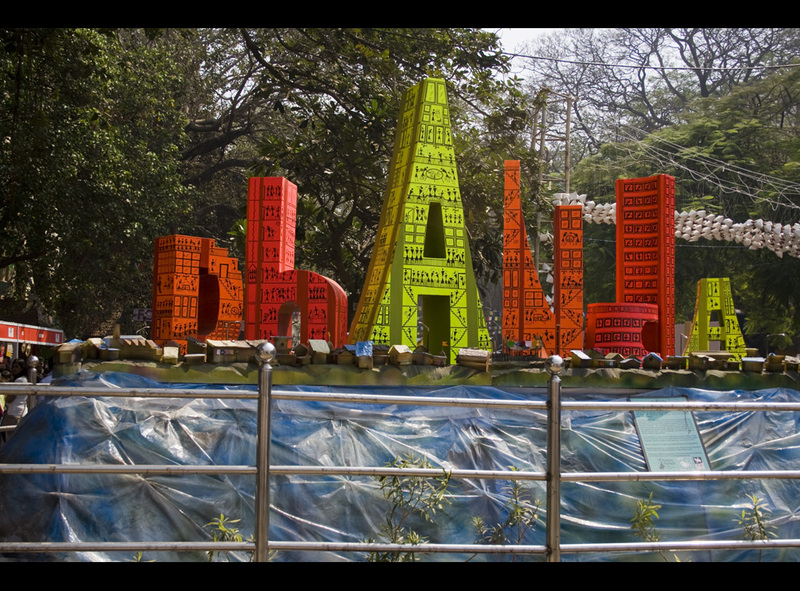 It’s a pity that such a vibrant and popular fest lacked in requisite basics like maps, signs and directions. I actually stumbled upon the help desk which was very “un helpfully” tucked away behind some art installation. In fact most of the directional signs were hidden rather than broadly displayed. Being new to Mumbai, I had trouble locating the spots and it would have been great if all the venues (which were in fact in the same vicinity) could have been color tagged or flagged or something to indicate as a key venue for the events. I did mention the same to the girl at the helpdesk who only smiled and nodded. Looked like she had heard this for the nth time today. I heard another lady visitor complain of lack of information on the passes being given out for many of the tours. I got late for the workshop and it was so full that I had to forgo it since I could neither see nor hear properly at the back of the crowded room. A unique offering of the festival is the Wine fest which is organised to educate people about wines. Lots of well-known ( and lesser known) wine brands participate in this – this year had Grover, Rivera from our backyard while others from Argentina, Chile, France, etc too found their way in. Hosts of activities like wine tasting, grape stomping, etc drew a lot of crowd to it. This event was available only for two days and a pass of 700/- was to be purchased for this daily. 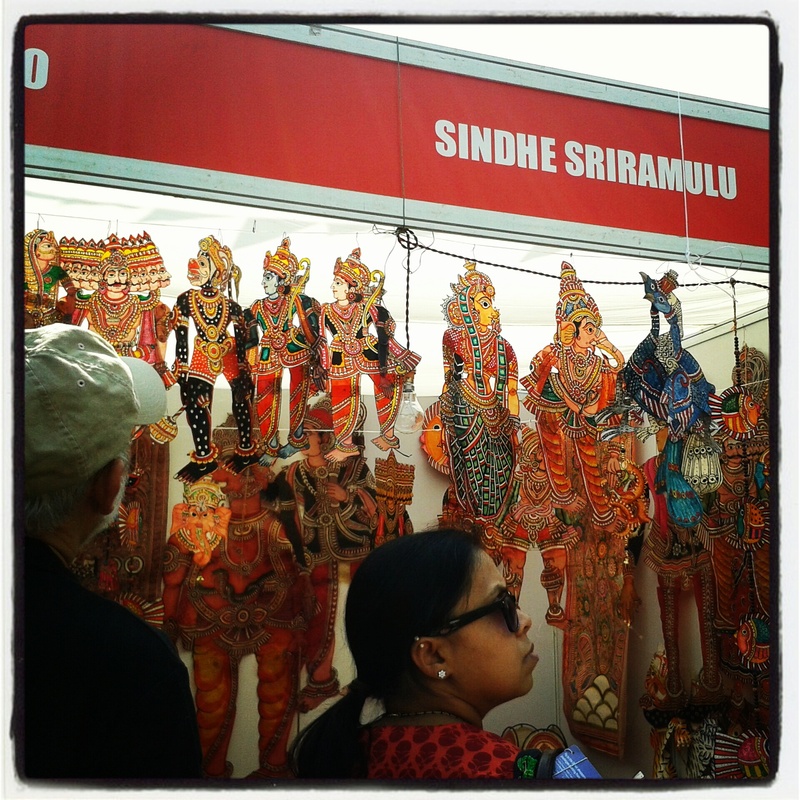 Since there was no fixed itinerary of its events, I skipped it as there was so much more to see and do at the festival. By the time I finished taking rounds and snapping pics, my feet were screaming out for a foot massage ( there were ppl from the Blind associations who were giving out massages to the visitors; but I simply didn’t feel comfy with the whole idea). I headed out to the Jehangir art gallery for a peek and happened to meet a wildlife photographer who was exhibiting his photographs on Sewri and the Flamingos. I was thrilled to speak to him as that’s my next must-do in Mumbai on this trip. Finally, sat down in Samovar (the canteen) for a snack and then headed home. Enroute, I encountered such wares on display in the streets, that I couldn’t resist buying some. One is this dried out weed which when put in water turns a beautiful green with fern like leaves. Very sceptical about this but what the heck!! 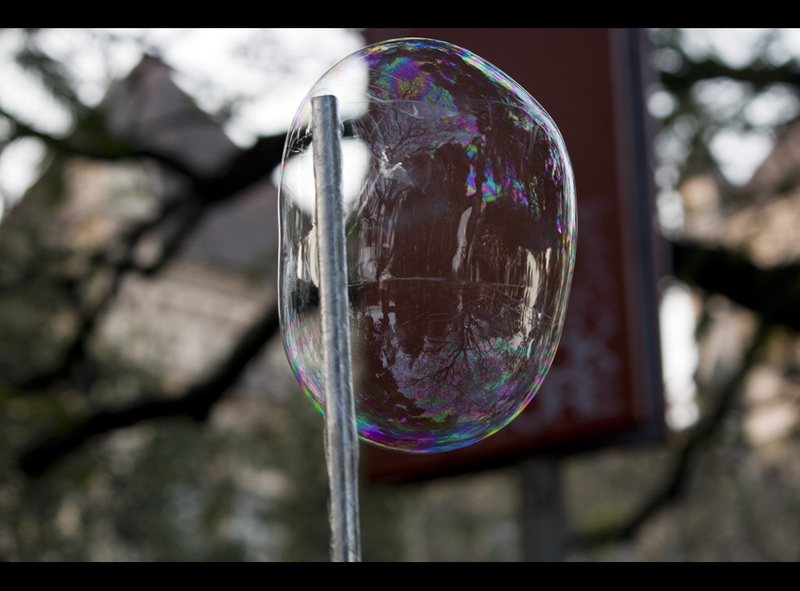 The second was this plastic like gel which you could blow into bubbles which don’t burst only deflate when punctured into a small plastic mass. But the reflections and colors in them captivated me to buy some. Now I need to blow some and try taking pics of the same. 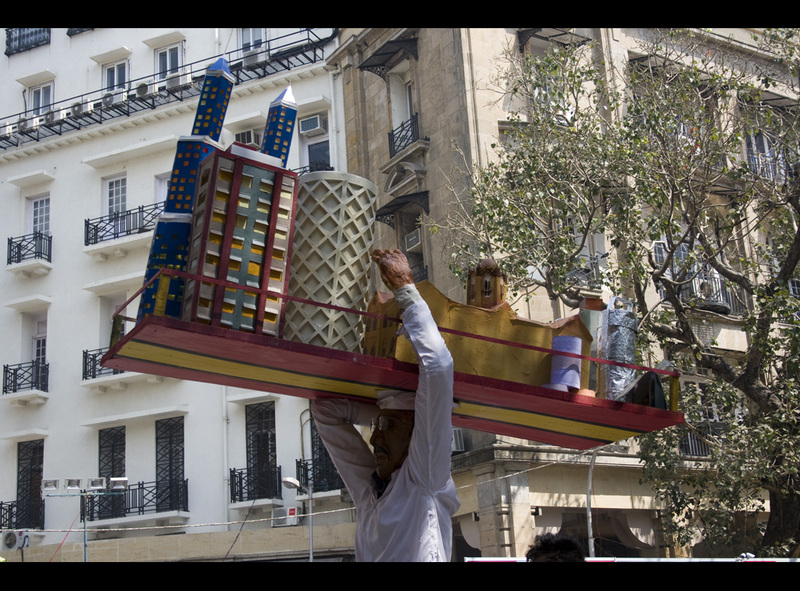 The streets held an equal amount of curios as the festival and were an equal draw with the visitors. Exhausted but sated with the day, I headed homeward. I had barely scratched the surface of the festival, such vast were its activities and display. 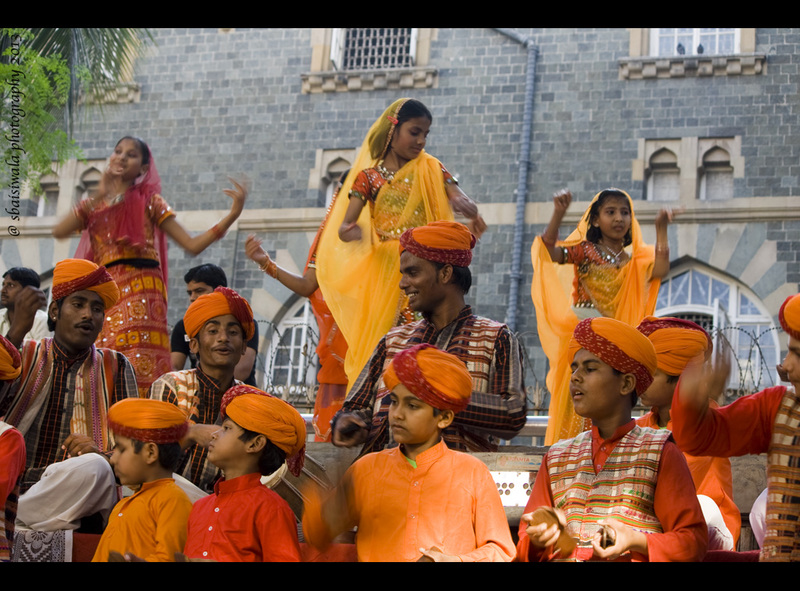 I hope to be in Mumbai for the Kala Ghoda Fest, next year and explore it some more. Previous Post Coconut Chutney – mumbaiya ishtyle! !